Conwy councillors have narrowly backed a council tax increase of 9.6%. 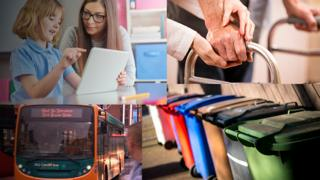 The authority - the first in Wales to launch monthly bin collections - faces a £16m budget shortfall. Sam Rowlands, cabinet member for finance, said council tax bills would still be lower than in neighbouring Denbighshire and Gwynedd. Labour councillor Ronnie Hughes said the Independent/Tory cabinet should have lobbied the Welsh Government harder to get more cash. Conwy is one of five councils seeing the biggest cut of 0.3% in Welsh Government funding, which covers about two-thirds of the authority's £229m budget. The Welsh Government said it had offered councils "the best settlement possible in this ninth year of austerity". The annual bill for a Band D property in Conwy will go up by £112 to £1,280, plus police and community council charges. Denbighshire will charge residents £1,327 from April, while Gwynedd already charges £1,301 with a 5.5% increase proposed. The Conwy cabinet had planned to increase council tax by 11.6%, but decided to soften the blow to residents by borrowing £1m from a fund earmarked for new school buildings. Cuts totalling £8.5m were approved, amounting to 4% for schools and social services and 7% for all other departments. Mr Rowlands told councillors that the cost of social care was expected to go up by £4.5m with Conwy having the highest proportion of people aged over 65 in Wales. Bob Squire, a member of the Conwy First independent group, claimed the council was doing nothing to end "the building of houses that are sold to retirees from England", claiming it placed a burden on local services. Councillors voted to back the budget by 29 votes to 25 with two abstentions.